A community benefits fund has given 1st Overton Scouts £1,046 to help provide equipment for their expanding members. This has provided 4 new four-person tents alongside an event shelter suitable for all weather types. 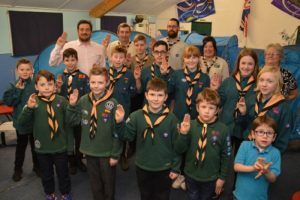 The past three years has seen the scout group rapidly grow in numbers and they were in need of new resources to enable all the scouts to enjoy outdoor activities. Erika Croskery, their group secretary, said “We’ve had brilliant feedback from everyone who’s so far been away camping in the new tents”. The grant for this new camping equipment came from a fund linked to Banks Renewables’ nearby Heysham South wind farm. Here a programme is in place to provide at least £300,000 worth of community support. This is part of Heysham South wind farms’ development package and will be distributed across its 25-year life span.